Ai Group Blog > Policy > Environment and Energy > What will new energy policies actually do? The disastrously high prices facing electricity and gas users across Eastern Australia are inspiring a lot of activity. Energy users and businesses using gas directly in production are looking for ways to cut their own costs, and a range of technology and services providers are eager to help them. Governments are searching for a mix of reforms that will reduce costs, maintain reliability and reduce greenhouse gas emissions. What is likely to happen? Businesses hoping to understand the situation could do no better than by attending Australian Energy Week 2017, a broad ranging conference running in Melbourne from 20-23 June. Ai Group will be presenting on some of the issues energy users face, particularly around natural gas. 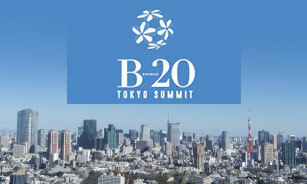 And a vast range of other speakers from politics, energy supply, energy use and more will dissect every angle of the crisis we face and the solutions on offer. 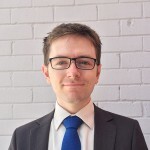 Two of the biggest questions to grapple with have potentially huge implications for energy users: the Clean Energy Target (CET) recommended in the Finkel Review of Energy Security; and the Federal Government’s intervention to secure adequate domestic supply of gas, the Australian Domestic Gas Security Mechanism (ADGSM). What are they? What are they actually likely to do? Take the ADGSM first. As Ai Group has argued, the expansion of Liquefied Natural Gas exports from Eastern Australia now dwarfs domestic demand, and supply has not grown as fast as gas producers hoped. Ultimately we will need to increase supply and reduce demand, but the options to do so will take time. In the immediate term the only options to rebalance the market are either to allow soaring prices to destroy swathes of gas-using industry – with all the consequences for investment and jobs that entails – or to divert gas from export to the domestic market. Export diversion could be done voluntarily by the gas industry through juggling their global supply portfolio, or meeting some of their export commitments with gas bought on international spot markets. But the Government has stated that if the gas export sector cannot resolve the situation itself, the Commonwealth will step in and exercise its power over exports to avoid any shortage. The ADGSM is the Government’s mechanism to achieve this. Will it work? The draft rules released recently suggest that it can. As Ai Group argued in our submission, the proposed system can be used to rebalance the market in the near term – but only if the Government maintains the resolve to act if necessary. If the final regulation put in place from 1 July this year looks similar, Federal Resources Minister Matt Canavan will have to make a decision by 1 November as to whether he expects a risk of a shortfall in gas supply in 2018. If he so decides, he will limit the volume of gas that can be exported overall, and in particular reduce the volumes from any exporters who are exporting gas that was not originally developed for export purposes. The Minister will have very wide discretion to make such a decision if he thinks the circumstances warrant it. If the Government credibly signals that it is ready, willing and able to invoke these export controls for 2018 and beyond, it is plausible that the gas export sector will itself make the necessary arrangements to rebalance the market. That would not return gas prices to their former lows of $3-4 per gigajoule; those days are gone. But it could plausibly bring prices down from scarcity-induced extremes of up to $24 per GJ to export parity levels in the $9-11 range. In any case, it will rapidly become clear if the Government is serious about the ADGSM, from the final form of the regulation issued shortly and the chain of decisions that the Minister will have to start making if the rule is to be used. Watch this space. What about the Clean Energy Target? This is a huge subject, and the full Finkel Report contains many important recommendations beyond the CET. But the CET has got most of the attention so far. What would it do? The CET is proposed to underpin new investment in electricity generation, which is needed given recent and looming retirement of old generators but extremely difficult given the risk and uncertainty in the current market and policy environment. Its second purpose is to ensure that new generation contributes to lower emissions and Australia’s Paris climate commitments. It would work by issuing certificates to clean electricity generators, and obliging electricity retailers to buy enough of these certificates to meet annual targets that tighten over time. That should sound familiar: it’s very similar to the existing Renewable Energy Target. The biggest difference is that the RET only supports renewables, while the CET would be open to any generation technology that is below a threshold emissions level. While new coal generators are more efficient than old ones, with all known technologies, they still have substantial emissions. Meanwhile, baseload gas has much lower emissions and renewables have zero direct emissions. Thus any proportionate incentive for low emissions is going to provide much more support to gas and renewables than to coal, unless coal is coupled with as yet unestablished very low emissions technologies like carbon capture and storage. In addition, and again given the current state of technologies, the underlying cost of new coal fired generators is substantial – conservatively estimated by CSIRO and others at around $80 per megawatt hour in the absence of any climate policy or carbon penalty. The relative revenue streams a Clean Energy Target would provide to different generator types are unlikely to make much difference to the competitiveness of coal against gas and renewables – not because of design decisions, but because coal’s emissions are so much higher. 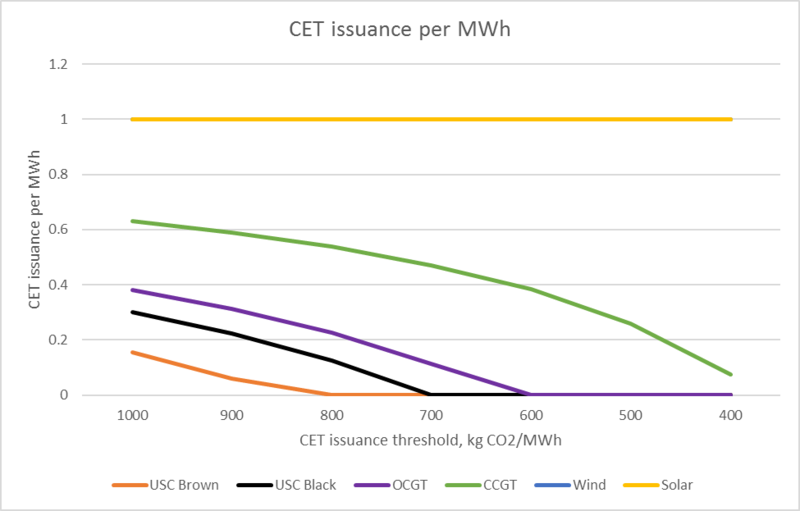 The first chart below shows how many CET certificates different kinds of generator might receive depending on where the issuance threshold is set. Even under a threshold of 1000kg/MWh, well above the current average emissions intensity of the National Electricity Market, ultrasupercritical coal would not earn much. USC is Ultrasupercritical; OCGT is Open Cycle Gas Turbine (peaking gas); CCGT is Combined Cycle Gas Turbine (baseload gas). Wind is onshore and solar is grid scale with single axis tracking. 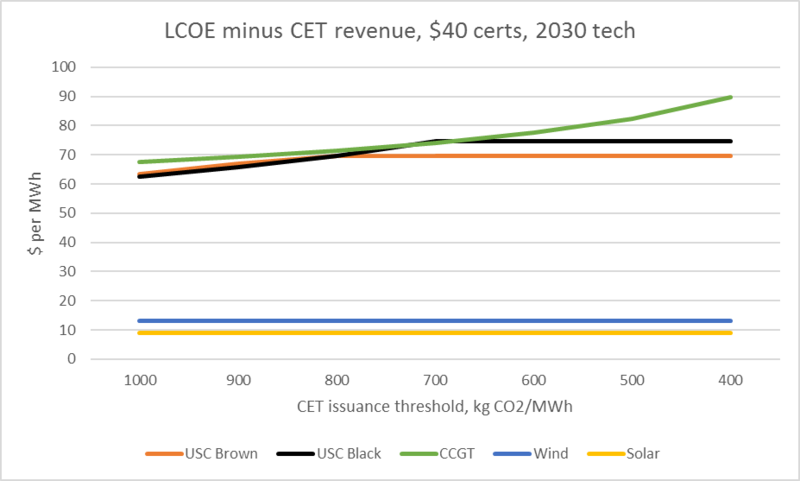 CET certificate prices arbitrarily assumed to average $40 (roughly in the middle of the price path modelled for the Finkel Review and about half current certificate prices in the RET). The merit order of the selected technologies barely changes, particularly within the 600-700kg/MWh threshold band around which debate has focussed. The picture is even starker if we look ahead – as any investor in a multi-decade asset is likely to. 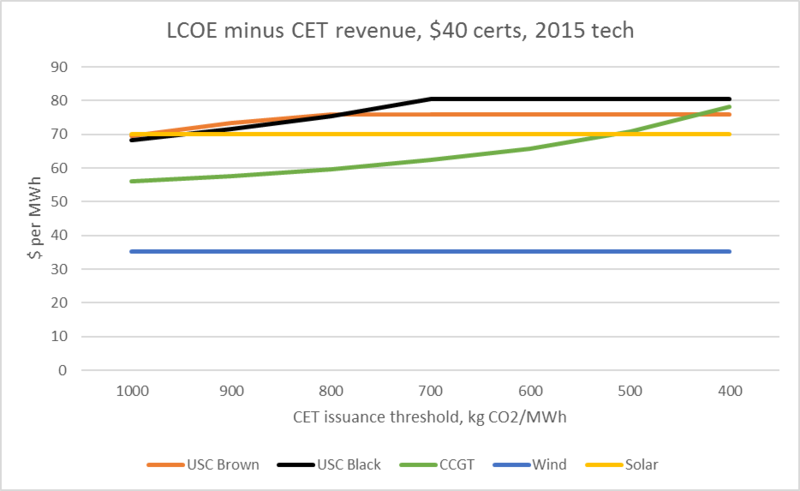 The following chart uses APGT assumptions about the rate of improvement in coal and gas generation costs, and adapts International Renewable Energy Agency projections for the rate of improvement in wind and solar costs. This analysis is very rough, but it is fairly clear that decisions about the CET issuance threshold make little difference to anyone. Impacts on consumers and existing coal fired generators will depend much more on the trajectory of targets under a scheme. 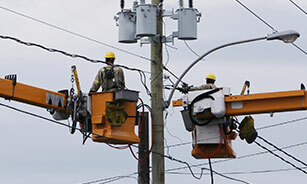 The relative prospects of different generation technologies will depend on the design of the proposed Generation Reliability Obligation, which would require new generators to guarantee some level of firm supply when needed, adding cost to renewables and potentially new revenue streams to gas generators that contract as backup. The prospects of new coal generators, which are likely to be too inflexible to operate as economical backup, would be dim unless they could radically improve on expected costs, emissions and flexibility. Even coal with carbon capture and storage is unlikely to prosper, since its lower emissions come with a substantial cost premium and it remains physically and financially unsuited to a backup role. This is just the beginning of months if not years of debate and implementation on the wide-ranging Finkel recommendations, as well as the ADGSM and many other gas-related policies. While it seems possible to get energy prices well down from their current catastrophic levels, it is also probable that prices will remain well above historic levels. Businesses looking to control their energy costs should also get along to one of the events Ai Group is running, including a free, live and interactive webinar on 5 July and forums around the country. These will combine a short update on market trends with expert insights into energy management options from better contracting to efficiency to self-generation and more. Energy users are going to have to adapt to higher prices. Ai Group will have more advice about how to do so – watch this space.